Durham & Gloucester Court is a regeneration scheme that extends the typology, scale and language of Alison Brooks Architects’ work in the South Kilburn Estate to establish a consistent urban character, in an area that has suffered from 1960s estate planning. Two mansion blocks embrace a communal garden, creating a family-friendly urban housing typology. 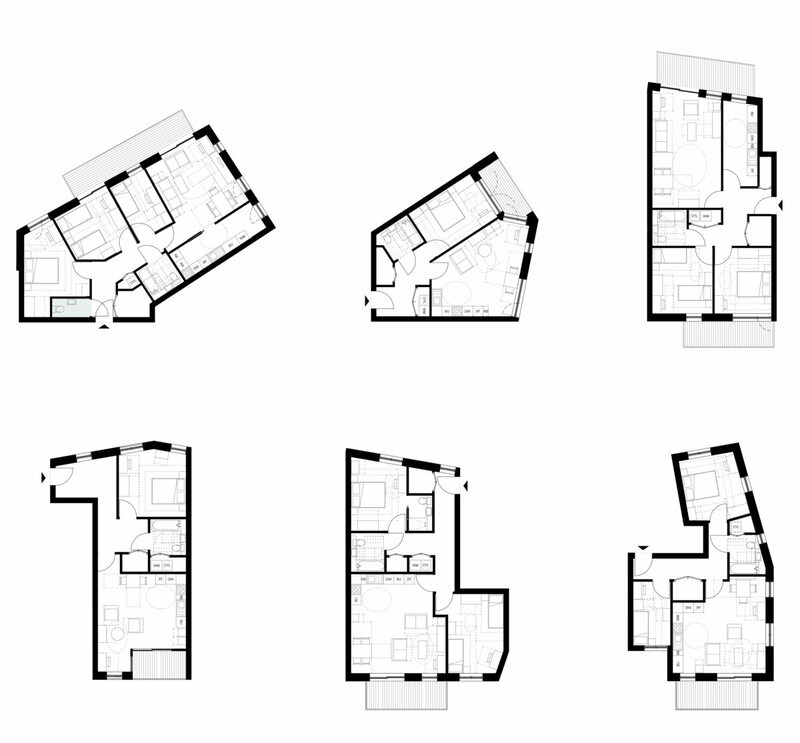 A wedge-shaped ‘Garden Villa’ completes the compressed quadrangle, forming a legible urban block. 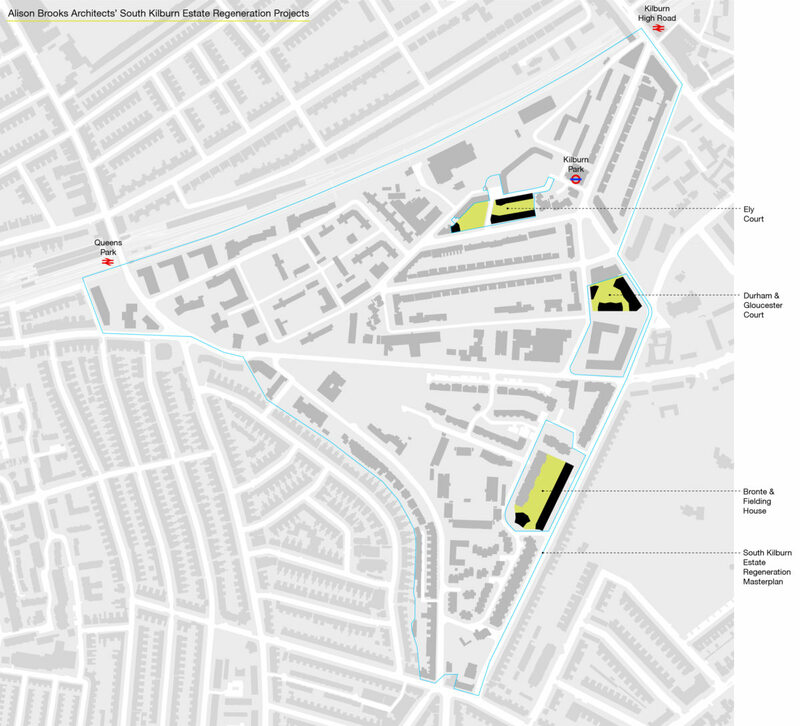 This 84-dwelling development forms part of the South Kilburn Estate Regeneration Masterplan for the London Borough of Brent. 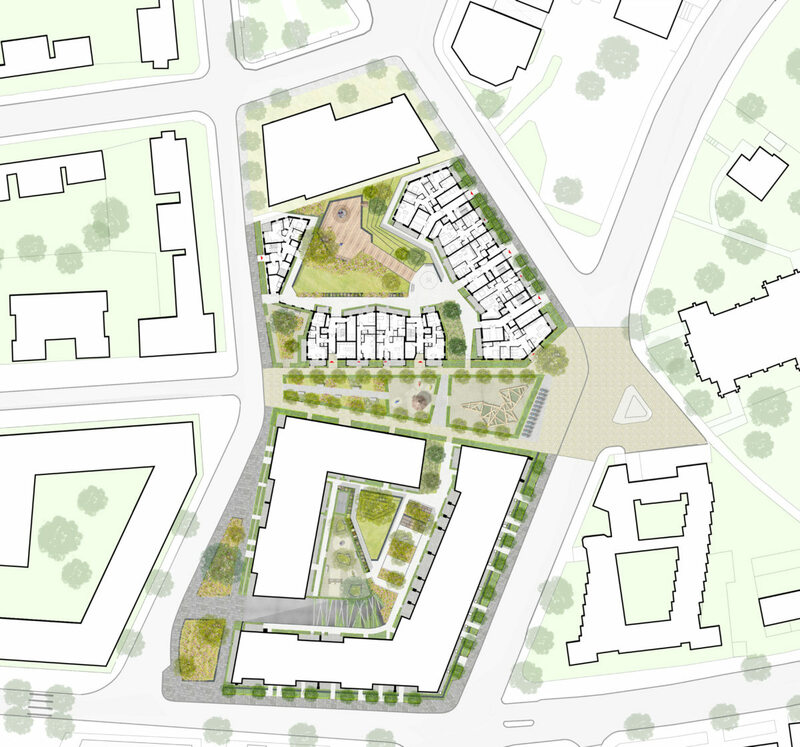 Phase 3 of the Masterplan is led by Feilden Clegg Bradley Studios with Alison Brooks Architects and Gort Scott, and landscape by Grants Associates. The team won a competition for a total of 236 new homes. 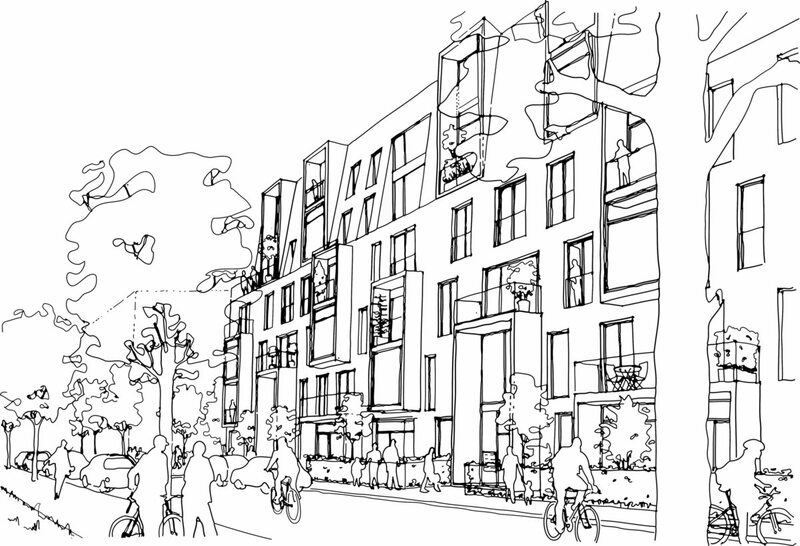 The scheme has received planning consent and is due to commence in autumn 2016. Mansion Terrace & Park Terrace are variations on the theme of the 21st C mansion block. 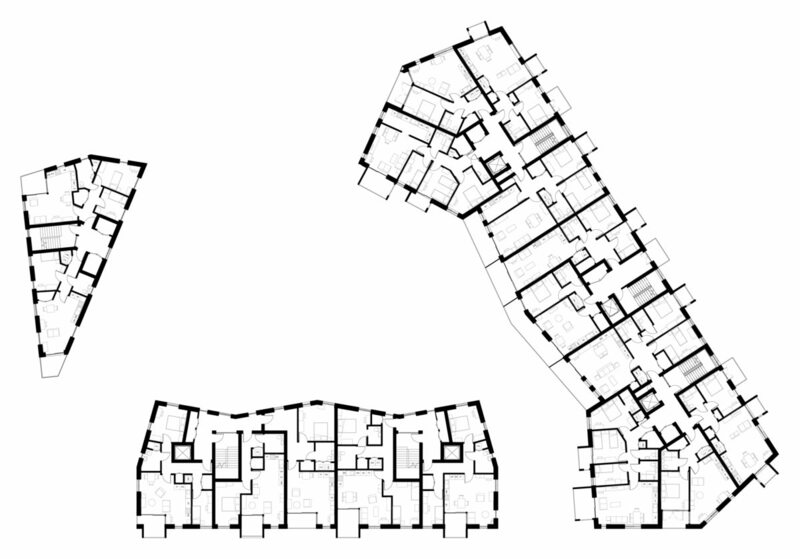 With between two and floor flats per core on each floor, this typology affords a wealth of dual aspect apartments, and activates the street with frequent entrances, which provide a sense of urban domesticity that is lacking in the existing tower buildings. Their mansard roof ‘figure’ is both a response to the elegantly tapering spire of St Augustine’s church opposite, and an abstraction of the highly articulated 19th C mansard roof. Two-storey volumes punctuate the façade, forming porticos and balconies that establish a domestic scale within this high density typology. These elements that are characteristic of late Victorian mansion terraces are simplified into rectilinear volumes, allowing them to form an abstract relief composition in dialogue with the carved form of the gable. Their difference in treatment from floor to floor retains the richness of their precedents, and offers distinct identities to different parts of the building. Pleated facades bring an informality to the courtyard side of the buildings, and help to resolve the site’s irregular geometry, while allowing additional units to gather around ends of terraces. The Garden Villa block is a transitional typology – a hybrid between the 19th century semi-detached villas opposite and its higher density neighbours within the scheme. Its ‘flatiron’ plan form, which is cut by an easement, relates to the carved forms of the other buildings’ mansard roofs and pleated facades. Subtle variations in brick coursing and cornice details begin to establish a language of its own. While the building preserves as much of a street frontage as possible, the ‘flatiron’ form permits surprising oblique views into the scheme’s green heart.